With the complete lighting enabled, all keys keeps the same intensity. But disabling lighting, or in other ways, a key sequence has with small glow, looking bad contact. That's odd. Do they light up when the backlight is ON? When the backlight ON, the mode 1 (all keys ON) - is apparently normal, all the keys remains constant lighting and with the same intensity. When the backlight ON, in other modes - The image problem appears, but the other keys remains normal. When the backlight OFF - image problem. *In some moments the problem disappears, and all modes are running smoothly. *It seems that the problem appears when the keyboard is idle. *When I'm typing enough, the problem disappears. I forwarded this problem. Seems like something is wrong. When you apply an amount of pressure it disappears, right? I think something is wrong with the Soldering/PCB. I will probably have an answer on Monday. Only happens in this line of keys that shows the image (TAB - \). * That seems very strange .. When I'm typing for a few minutes at a time .. the problem disappears. With the v1.19 firmware has not had this problem at any time. The problem started after upgrading to v1.20. Thank you very much your attention. Can you reinstall firmware V. 1.19, and see what it does? I have a similar problem but in the upper ESC-F-key row. 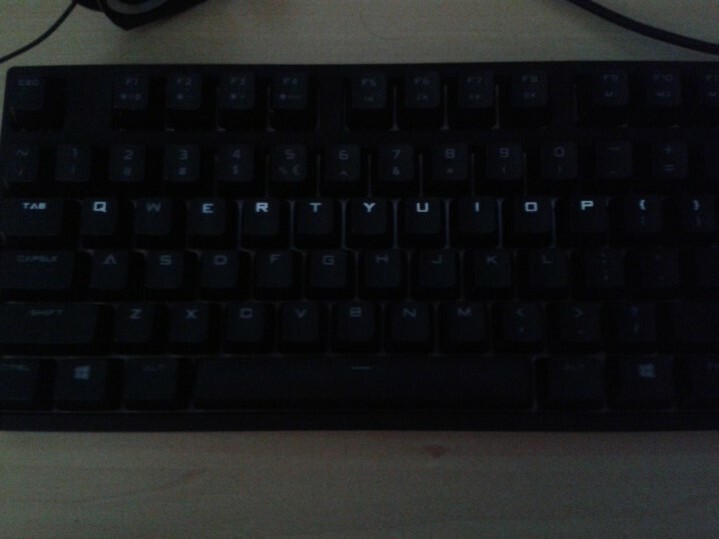 When I turn off backlighting, it turns off normally, but after some time (not always) most of the top row keys light up slightly by themselves and it looks just as in the picture above. Replugging the keyboard doesn't help (after unplugging and plugging back in, the lights are just the way they were before). What helps to disable the lights is turning the backlighting on and then back off. Also, this didn't happen with 119 firmware. Unable to return to the previous firmware. Tested in other desktop and the same problem occurred. However, tested in a notebook and just does not happen this problem. Try other USB ports and tell us how proceeded. Alright, thank you. I have sent out another e-mail. I will keep you posted. Sadly i got same problem. I just got my keyboard today and updated the firmware. After it i checked my ' to = sequence keys have same problems with light options turned off for the region.